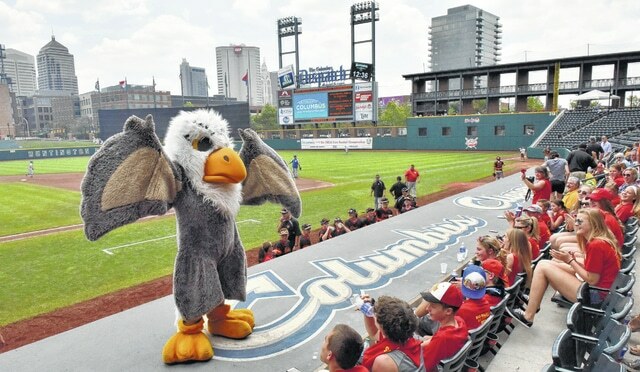 Big Walnut’s Golden Eagle mascot fires up the BW fans during the OHSAA DI State Semifinals at Huntington Park in Columbus. It’s said that all good things must come to an end. For Chris Holly’s Golden Eagles, making their first-ever State appearance, that happened Friday afternoon as Big Walnut (22-10) , making its first-ever State tourney appearance, came up short by an 8-1 count against the Defiance Bulldogs (27-5) in a Division II OHSAA State Semifinals game played at Huntington Park in Columbus. Defiance, coached by Tom Held, which came in as a two-time State champion, having won title titles in 1992 and 2013, took an early 2-0 lead with solo runs in the first and third innings. Senior third baseman Garrett Sierra walked and senior right fielder Wes Detter beat out a well-placed bunt back to the mound to put Bulldogs at first and second. After Big Walnut starter junior Tommy Fleser retired the next two batters, putting runners at second and third, Sierra stole third and scored on junior catcher Nick Green’s throwing error. In the third, with one out, Bulldog junior pitcher Shay Smiddy lined double down the right field line, advanced to third on an error by senior right fielder Brandon Daniel’s error and senior second baseman Ty Castillo, who reached on an error, scampered home on senior catcher Gage Cordray’s single through the left side of the infield for the 2-0 Bulldog lead. Defiance, which came into the game riding a 10-game winning streak, made that lead stand up through the first six innings.Big Walnut, which came into the State riding a 12-game win streak, managed three hits off Smiddy through the first three innings. threatened in the fourth with singles by Green and junior third baseman Jakob Evans, and a walk to senior shortstop Matt Tarney, but Green and Evans were left stranded at first and second as Smiddy quelled the threat. Defiance closed out the Golden Eagles with three-run rallies in the sixth and seventh inning to open up an 8-0 lead. In the sixth, senior first baseman Jimmy Bauer laced a triple to the 365-foot mark in right-center field and came home on Castillo’s single to center. With Castillo at third and sophomore left fielder Bryce Borton, who had walked at second, both came home on Sierra’s controversial sacrifice fly for a 5-0 Bulldog lead. In the seventh, Defiance put the game out of reach with three more runs as Castillo was hit by a pitch, senior Alec Rivers reached on an error as Castillo stole home and Rivers stole second. Sophomore Braden Frederick singled to right, plating Rivers, and Sierra doubled Frederick home for the 8-1 final. Big Walnut, backed by the urging of a large contingent of Big Walnut fans behind the Golden Eagle dugout,tried to tally late. After sophomore third baseman Parker Imertreijs was erased by a third-to-second-to-first double play in the in the sixth inning, the Golden Eagles finally pushed across a run in the seventh. Tarney and Evans opened the frame with back-to-back singles. Senior Chad Little pinch-hit for sophomore Henry von Hollen and forced Evans at second as Tarney scored. After junior Andrew Klamfoth pinch-hit for Daniels and singled to left, Davis came on to run for Klamfoth, senior Michael Blackburn flied out and Moser forced Davis at second to end the threat and the game. Defiance pounded out a dozen hits in the victory, led by Detter, who was three-for-four with a walk and thee runs batted in; Smiddy, who was two-for-four with a run and a walk; Bauer, who was two-for-four with a run; Frederick, who was two-for-three with a run batted in. Evans led BW’s six-hit attack, going two-for-two with a walk. On the mound, Smiddy went the distance for Defiance to record the victory, giving up one earned run on six hits and four walks. He struck out four Golden Eagles. Fleser made the start for the Golden Eagles, allowing two runs, none earned, on six hits and two bases on balls while fanning four. Freshman Austin Becker threw the final three innings for BW, giving up six runs, three earned, on six hits and two walks. Holly is counting on Big Walnut’s first-ever State appearance to be a stepping stone for more postseason appearances in the future. Defiance completed its bid for its second State championship by defeating Poland Seminary (28-3) by a 5-3 score for the DII State crown Saturday at Huntington Park. Poland Seminary won Friday’s other DII semifinal matchup with a 2-0 vict0ry over Bishop Watterson (24-9).